What is the most common repair on a foil kite? One of the most common foil damage is a blown baffle which is from the kite crashing leading edge down on a hard surface. What happens is that the kite is filled with air and when you let the kite hit leading edge down all that air is trying to escape the kite which has alot of pressure. The pressure will find the weakest spot on the kite which is usually the baffle. 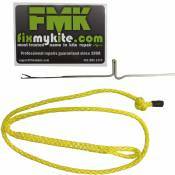 How does fixmykite.com repair baffle blow out? How does fixmykite.com repair sail cuts on a foil? Here at fixmykite.com we use two different techniques to repair sails on foils. The first technique we use is doing a panel replacement. A panel replacement is when we have an exact color match of sail material and we replace the damaged area with a new panel that is slightly larger than the damaged area. The other technique we use is using sail tape. We use either clear sail tape (for all colors but black) or black sail tape. We usually use sail tape on severe sail damage like large panel blow-outs. We put sail tape on both sides of the sail material and sew it. Now that area is twice as strong. That is why we guarantee our repairs. Can I replace broken or damaged bridle lines? Yes, we have all types of lines that we can custom cut and sew for your kite. We have leader line in 4 different colors. Also we have 2mm sheathed dyneema in 4 colors and 3mm sheathed dyneema in black, red, and blue. How do I measure my bridles? How to replace a bridle?